Designed to protect the crop and machine during late season applications where the intrusive wheel hub of the machine may come in contact with the crop. This streamlined design keeps the machine to its narrowest profile and gently deflects crops away from the wheel and hub. The Covers are made from high strength polyethylene with powder-coated and custom zinc plated hardware that mount directly to the existing threads on the wheel studs beyond the factory wheel nut. 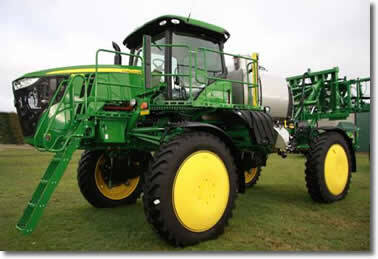 Most commonly used in corn applications for Y-Drops, Seed corn, and Fungicide/Insecticide applications. Also have great benefits in Soys, Wheat, Cotton, etc. and can remain on all season. The hub covers provide a sturdy and efficient way to deflect crops away from the wheel hub. They are engineered to limit avoidable crop damage and increase crop yields. The owners/operators also reap benefits from the hub covers with regards to maintenance. Being constructed from a polyethylene material, they are virtually stain resistant. The hub covers are durable, yet clean easily, and will save hours of labour every season. These covers are engineered to be a completely flush mounted system. They are designed to be used on every crop, every season, and in all conditions. Our hub covers are designed to seal on the bead of the rim to eliminate debris from getting behind them. These covers have a directional louver moulded into each part that is designed to draw air from behind the cover and to limit debris from entering. We utilize the factory wheel studs so we can mount the cover securely and efficiently to the machine. An entire set of hub covers can be installed in under thirty minutes. By simply threading our extensions onto the threads that protrude beyond the lug nut, and torquing them to required specifications we can transform the machine effectively. Notice the wear on the rim and wheel hub caused from impact with crops. With the advances in chemical technology and the proven yield benefits from. The height of the ear in relation to the location of the hub on the sprayer. 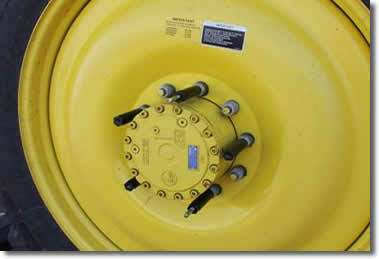 If there was no hub cover to deflect the crop their would be a direct impact of the wheel hub on the corn cob. The image on the left shows tar that has accumulated after 4000 acres of applying Fungicides on corn at tassel. The covers were left one month and then were sprayed with a pressure washer using cold water at 1500 psi. No scrubbing was required. Crop Damage from tires can not be avoided, but why extend your crop impact width by almost 5 inches per wheel? That is nearly 20 inches per round lost. These hub covers are designed to gently deflect crops away from the blunt impact of the wheel hub. Crops will follow the curve of the hub cover and simply deflect away from the damaging hub, returning to their original, upright position. 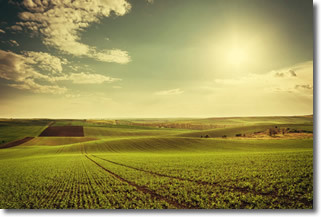 With current GPS navigation systems the same wheel tracks can be utilized each time through a field. 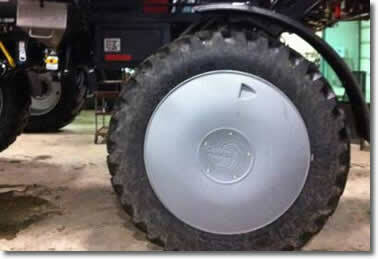 With these Hub Covers you are guaranteed to limit crop damage to only the tire track. Standard - 12" wide rim. Special Order - 10" wide rims or different diameters. Please specify when ordering. A set includes: two left side covers, two right side covers and all mounting hardware. Standard - 12" wide rim. Special Order - 10" wide rims or different diameters.Please specify when ordering.